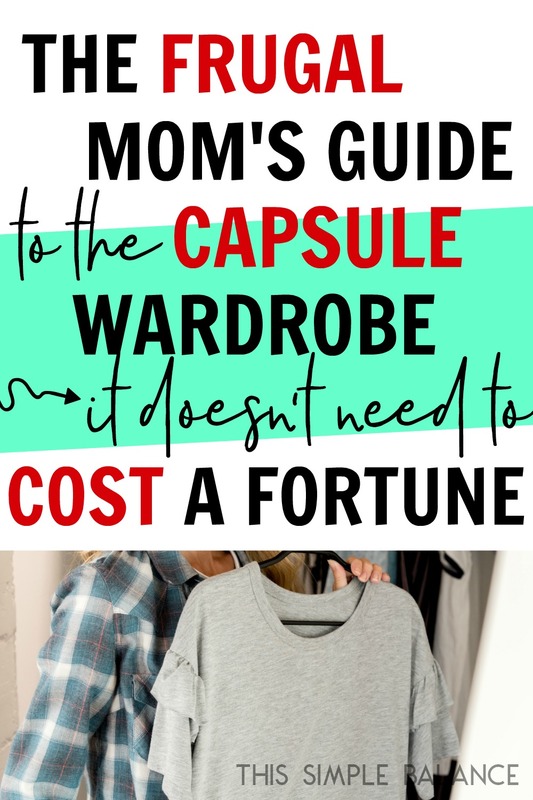 Inside: In my opinion, moms need capsule wardrobes more than anyone else, but they don’t need to cost a fortune. Capsule wardrobes are for frugal and non-fashionista mamas, too! In a world chock full of choices at our fingertips, we parents suffer decision fatigue more than others because we make decisions for more than one person ALL. THE. TIME. Building a capsule wardrobe significantly reduces that decision fatigue. Capsule wardrobes also save money, but the best part is that they simultaneously save time and energy. What mom doesn’t need that? What is a capsule wardrobe, anyway? Susie Faux, the owner of a London Boutique, originally coined the phrase “capsule wardrobe”. She defined it as “a collection of a few essential wardrobe items of clothing that don’t go out of fashion, such as skirts, trousers, and coats, which can then be augmented by seasonal pieces” (source). I would add that those essential items can easily be mixed and matched 95% of the time. I am no fashionista and certainly no authority on capsule wardrobes, but I immediately latched onto the idea when I read The Life-Changing Magic of Tidying Up two years ago. It dramatically changed my approach to building my own wardrobe, an approach I eventually applied to building my husband’s and my kids’ wardrobes. Why do I need a capsule wardrobe? The result was wardrobes across the family that rarely coordinated easily and often wasted money on pieces that coordinated with absolutely nothing. Outfits needed to be chosen carefully every day, and let’s just say the littles in the family did NOT know what that meant. Let me ask you this: Have you ever debated whether or not to allow your child outside in a obviously (and often glaringly) mismatched outfit? Do you argue with your three-year-old about her outfit more days than not? If that’s you, you need the capsule wardrobe, my friend. If you can prevent battles that can be prevented are absolutely worth your time. Personally? I can instantly grab almost any 2-3 pieces from my closet: I love them, I feel great wearing every single thing, and they coordinate. Enough said. Is it really affordable? I thought a capsule wardrobe was for people who spend a lot of money on clothes. If you’re like me, when you hear the term “capsule wardrobe”, you think expensive, impractical, designer clothes – totally inaccessible to the family piecing together wardrobes from Target, Old Navy, hand-me-downs or consignment stores. But it’s not true! 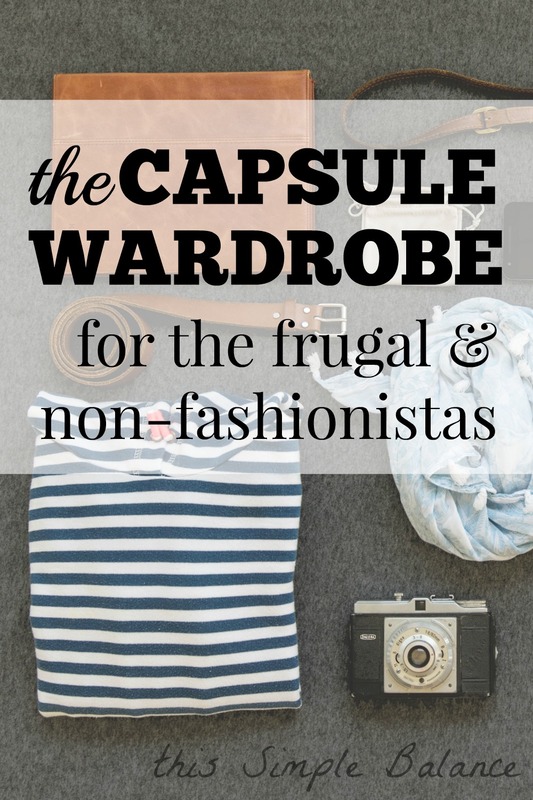 You can have a capsule wardrobe on a budget. Its basically just a fancy way of saying you want a minimalist wardrobe with pieces you love and that mix and match easily. You are committing to choosing more carefully the pieces you add to your wardrobe. Whether you get those pieces from Stitch Fix, Banana Republic, or thrift stores is entirely up to you and your budget. You can build a great wardrobe using any of those options. So yes, a capsule wardrobe can be very affordable, with a little perspective shift. 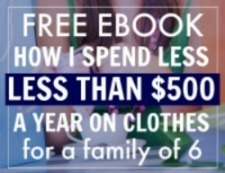 I spend less than $500 a year on quality clothes for a family of 6. Subscribe to get my regular e-mails to get this full, 52 page guide with all my tips as free welcome gift! Can capsule wardrobes really work for moms with little mess makers (ahem, I mean, little kids)? After I started building my capsule wardrobe but before I developed a weekly laundry routine, I honestly questioned whether or not capsule wardrobes could work for the stay-at-home mom with young children. The kids managed to dirty my outfit every day, one way or another (they have so many ways, don’t they?). I hardly ever wore the same clothes twice, and I constantly ran out of clothes. All my clothes, except workout clothes, underwear, and pajamas fit in this small closet. For those of you who want to live in workout gear, please do it – we have enough mom guilt about every other thing, and I’m certainly not going to heap on more. I’ve had my share of yoga pants and sweatshirt seasons during these years of riding the waves of pregnancy body/post-partum body/post-post-partum body/normal-sized body, only to do it all over again. But personally, I’ve found that I feel a million times better about life when I’m showered and dressed properly (and by properly I mean in skinny jeans and a nice tee). Granted, my wardrobe looks much different than when I worked full-time, but my skinny jeans, nice tees, and button-down flannels make me feel like a grown-up. 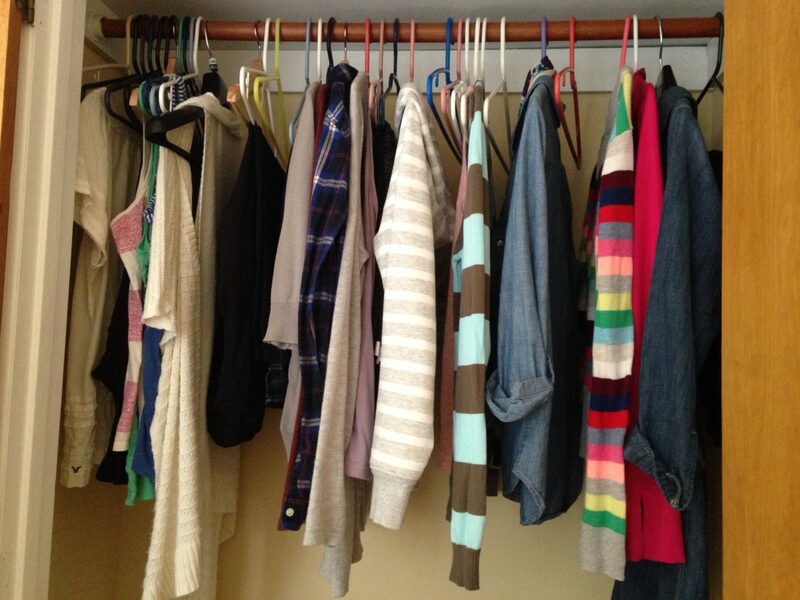 1) Assess your entire wardrobe, in season and out. 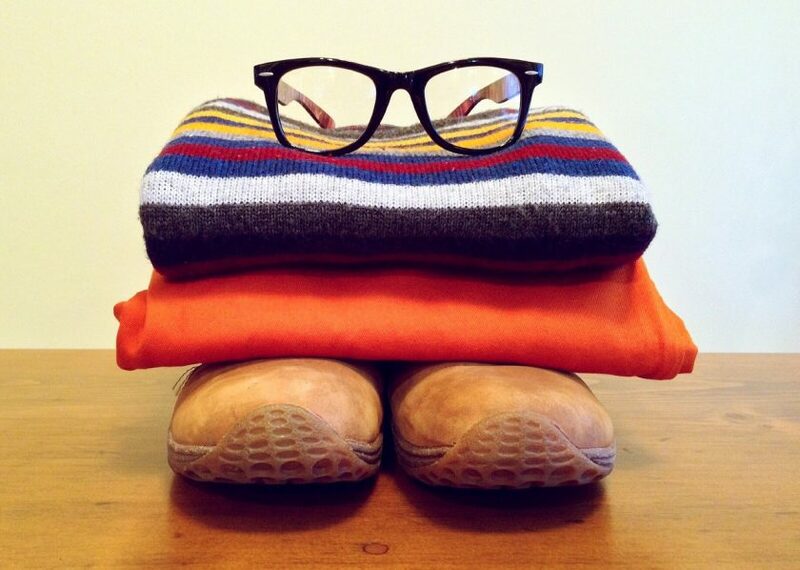 Gather your entire wardrobe, in season and out. You will need two boxes or bags: a “donate” box and a “maybe” box. Start with items you NEVER EVER WEAR. No matter how much you paid for them or who gave them to you, bottom line: do you wear it? struggle with the idea that you might need it one day, in a future you can’t quite define right now, read this article by Tsh Oxenreider – a genius way of viewing thrift stores as storage units. Move on to items you wear occasionally. Is the fit and color flattering? I spent years wearing clothes for my ideal body…that wasn’t my actual body. And I always felt self-conscious. Now, when I purchase clothes, I consider how I want it to fit and size it accordingly. I used to buy small sized tees, now I buy medium or large because the draped fit is far more flattering and comfortable for me. I also bought clothes that were pretty on a hanger, but color-wise did not flatter me at all. Now, I’ve narrowed my colors to navy, white, gray, and wine-colored tones. If the answer to the questions above is a resounding “NO”, put it in the “donate” box. If the answer is maybe, or for whatever reason you are unsure, put it in the “maybe” box. This box will sit in your basement or garage for 6 months. If you never think about items in that box for six months, off they go. But think of it as your safety blanket if you get cold feet about getting rid of so much stuff. I do most of the shopping for my husband. He hates shopping. I also manage most of the stuff in our house, decluttering fairly regularly. But whatever you do, do not give away your spouse’s clothes without his approval (unless the last time he wore it was in high school or it’s clearly in unwearable condition…definitely done that). It’s an honor thing, as much as I love to toss stuff, it’s not mine. 2) Consider the items you reach for every single day. What do you miss when it’s in the laundry? What is your impulsive go-to outfit when you have your full wardrobe available to you? Once you’ve determined those pieces, study them. What do you love about them? Comfort? Color? Fit? Style? Write down your answers, possibly in your bullet journal, or somewhere you won’t lose it. 3) List the items you’re missing. Hopefully, you started a weekly laundry routine as suggested in the first post of this series. If so, figure out how many pieces you need to last a little more than one week (in case the inevitable emergency situation comes up). Use these numbers to gauge accurate quantities for your missing items’ list. 4) Look for classic pieces, ideally ones that can be worn across seasons. If you’re closet is a bit sparse after this process, resist the urge to rush out to the store, which will completely blow your clothing budget! True desperation looks like – I have just one pair of pants left. If you have 3-4, you can probably live and take the time to build your wardrobe back up slowly. Remember the “donate” box? It’s your safety blanket, your backup plan. So breathe, and think long-term, here. A little patience will save you tons in the long run. What’s a good number of clothes? Well, I’ve heard the number 37 (items) tossed around by bloggers who write about capsule wardrobes. This number includes shoes, bags, and jewelry, but excludes workout gear, pajamas, underwear, socks etc. But ultimately, you need to find the number that fits your lifestyle. Thanks! Everywhere I look it seems capsule wardrobes have to be crazy expensive. I KNOW I need to get rid of a bunch of t-shirts from volunteering that I just don’t need anymore, but I have to just throw them away. Do you have any ideas? BUT this makes so much sense. I don’t buy clothes very often, but I tend to hang on to pieces forever, forget that I hate them and have to wash them over & over. ha. And this explains why our laundry is a nightmare! It is SO helpful. Even today, I was trying to think of what my life was like before the capsule wardrobe…I spent SO MUCH TIME getting dressed and I used to change outfits frequently. And laundry – I used to be behind on laundry constantly. Now I get backed up on laundry occasionally, but it is much more manageable. Love this. The beloved cardigan is my wardrobe workhorse because it can take a nice short sleeve and make it suitable for cooler weather, or it can take a dress and tone it down to make it work appropriate (casual workplace here). I also eventually had to come to terms with the fact that I feel best in neutrals, navy, and maroons. I want to want to wear greens, yellows, baby blues, oranges, etc…but it’s just wasted money and wasted closet space! I love your idea of “what do I miss when it’s in the hamper?” because it cuts through all the “I wish I liked X piece of clothing” thoughts. Thanks Robin! I love all those colors too…Sad they don’t look good on me either. I save those for my house instead. When I read “frugal and non-fashionista” in the image of your post, I was like, ” Ooooh, me, me, me!”. I gleaned so much from this post, so thank you! I’m assuming that my closet looks a great deal like yours with white, grey, navy and maroon/wine. I have A LOT of black too 🙂 I actually printed this post out so that I can start to implement it. Thank you so so much!! Thanks Mrs. Daisy. 🙂 I bet our wardrobes do look similar! As far as black goes, I have some pieces that are still black, but I’m realizing navy needs to be my black when I purchase replacement items – much more flattering. I’m glad you got so much out of it!